As per the Legislative Assembly announcement made by Hon’ble Minister for Fisheries, Finance, Personnel and Administrative Reforms Department, followed by G.O. 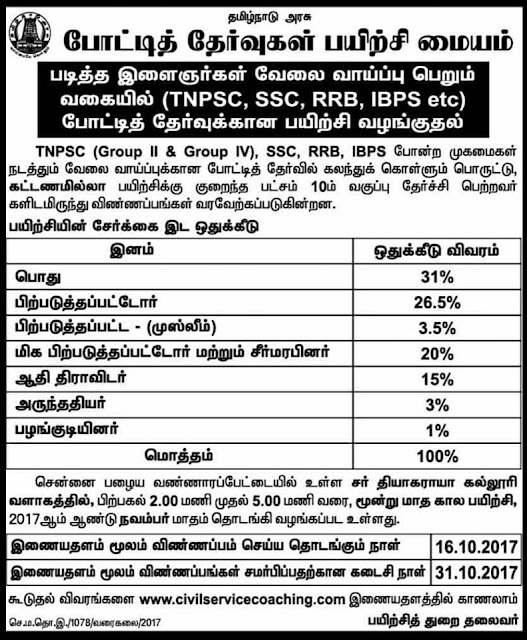 (Ms.) No.123, dated 15.09.2017, a new competitive examinations coaching centre is established at Chennai. The centre will start functioning from November 2017 at Sir Theagaraya College Campus, Old Washermenpet, Chennai – 600 021. This coaching centre provides coaching for most of the Central/State/Banking services. The duration of coaching will be 3 months. The coaching is a non‐residential programming. The entire coaching is provided free of cost. Necessary materials will be provided free of cost. Practice Tests will be conducted on a regular basis. The selection of trainees (500 trainees for 3 Months) will be made on the basis of total marks obtained in X Standard Public Examination following the reservation norms of the Government of Tamilnadu. Apart from the Principal and two regular faculties, a number of guest faculties will be engaged to coach the candidates. 4% of the seats are earmarked for differently abled candidates as per Government orders in force. Coaching Location: Sir. Thiyagarayar College, VannaraPettai, Chennai.